Three Kings Day is a major celebration in our home as well as in many Latin American countries. For us it is the culmination of the holiday festivities that kicked-off with Thanksgiving. As in years past, we love to celebrate this day with little one’s friends. Letting them take part is a wonderful way to give them a little insight into our Latin holiday celebration. This year we had a Three Kings Day fiesta! 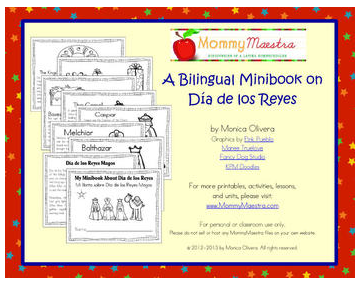 As an introduction I read to the kids Mommy Maestra’s Day of the Magi – Dia de los Reyes – Bilingual Minibook. I highly recommend this minibook because it explains the story of the magi, and everything that entails the celebration of El Día de Reyes from the rosca de reyes to the shoes, and the shoe box. Can I begin by saying how excited I was to find a Mexican bakery not too far from our home that bakes the famous rosca de reyes (king’s cake)!? I also found in Walmart “Abuelita’s Mexican chocolate.” Double score! Since the party was during noon time, I served sandwiches in the shape of a king (with a cookie cutter), fresh fruit, a cookie; and I sliced the rosca de reyes and put them on a plate served with warm (not hot) Mexican chocolate. The kids had a blast going through each slice of bread looking for the small “baby Jesus”, and they found two! To get the party started the kids watched Dora Celebrates Three Kings Day! DVD. This movie is not the story of the magi, but it does get the kids excited about Three Kings day. I read the book Verde Navidad. The date is set on the eve of Three King’s Day January 5. It’s a sweet book about an Abuela who visits her grandkids in the city. She brings shoe boxes for them to fill with grass for the horses (in this story the Three Kings travel by horse and not camels). They set out to look for grass, but living in a big city they can’t find any. Luckily, Papá tells them to color and cut green paper to put in the shoe boxes, and on Three Kings Day the kids wake up to treats and gifts. The kids made king’s crown with strips of colored paper that they decorated with glitter, and decorative appliques. They also colored Three Kings coloring pages. I made glitter stars in card stock paper, and cut in squares. I hid the stars out in the yard for the kids to search symbolizing how the magi searched for the star of Bethlehem. This game had a twist on how it was played. I hid the stars, and if they were close or far away, I’d say “frío o caliente”(hot or cold}. Hot if they were close, cold if they were totally off! This was a childhood game that I learned and played when I was a child in Puerto Rico. They really enjoyed themselves, and had lots of fun. 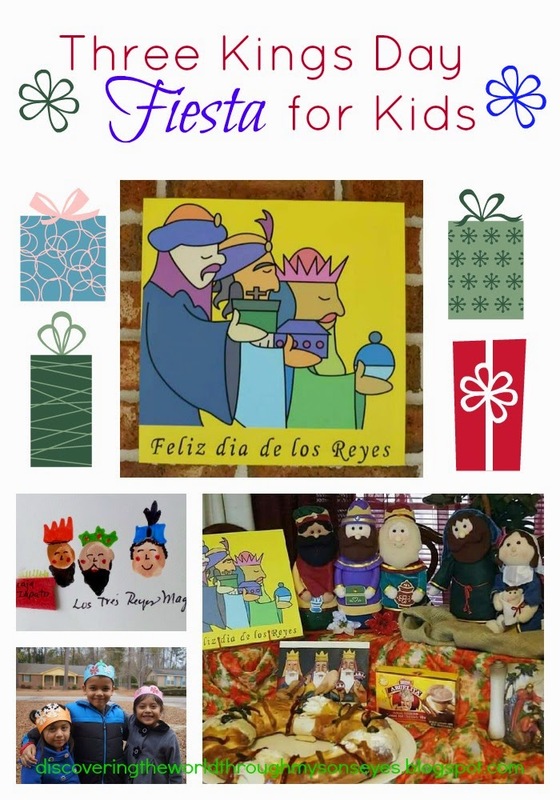 Celebrating “Los Tres Reyes Magos” in the U.S.A.
Scroll below for some pictures of our fiesta! This just came across my Pinterest feed- what a wonderful post!! Thank you for sharing!